Ah, Pleasantville: Our First Delivery from a Local Organic Dairy. What a pleasure to receive our first milk delivery today. Like canning and knitting and other homey rituals of yore, milk deliveries are making a comeback. I knew the South Mountain Creamery we used to patronize at Baltimore’s Waverly Farmers’ Market delivered, but we never took advantage of that service. And here in Oregon, we’ve usually purchase local Lochmead milk (until learning their plastic containers might contain BPA) and then increasingly Organic Valley. But who knew we had other options? It turns out local organic Noris Dairy, in nearby Crabtree (Scio area) delivers to Corvallis once a week. Our friend Amy in Eugene had raved about their milk. I even got to sample some steamed in a frothy cappuccino she prepared for me. But it was only at the recent Chef’s Show-Off and Local Foods Fair Ten Rivers Food Web hosted at LBCC that I learned about the home-delivery service. 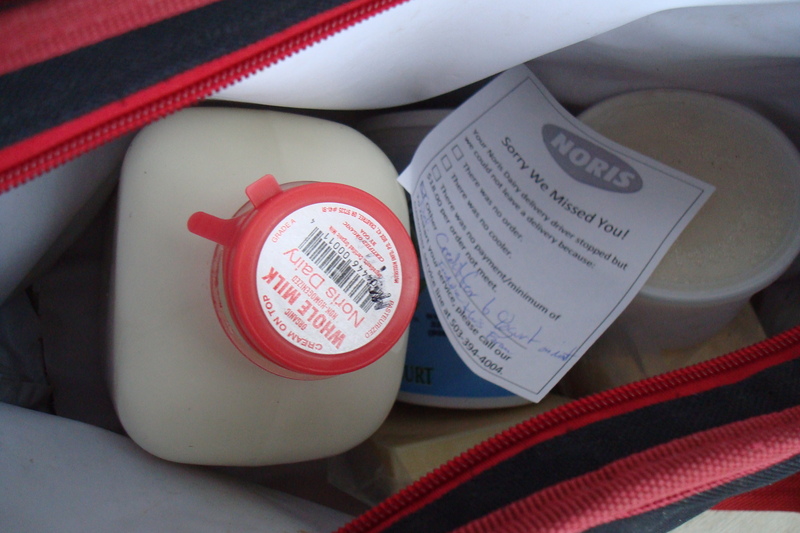 At that event, Noris kindly plied us with samples of cream-top milk, chocolate milk, and several cheeses (the mozzarella was good: perfectly salted). Then I called in a delivery. 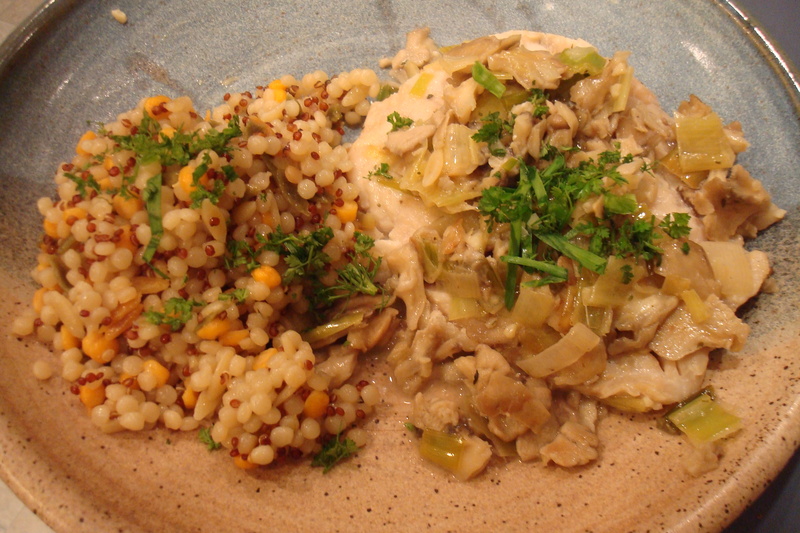 Sauteed some Oregon sea bass in Noris butter with maitake mushrooms and leeks, topped with chopped chervil from the garden. When I returned home from teaching today, there the insulated bag sat on the front stoop, full of non-homogenized milk, blocks of cheese and salted butter and a container of ricotta. It’s less processed, and I believe pasteurized at lower temperatures, than your standard bland supermarket milk. They ran out of the fruity yogurts I ordered, but Noris left an I.O.U. to redeem with our next order. The butter added a lovely touch to the local sea bass (not to be confused with the over-fished Chilean variety) I sauteed up with some maitake mushrooms and leeks for supper. Glad your blog is up and running again. I remember having to stir in the cream that rose to the top of the milk we had delivered to our door, oh so many years ago. Your blog makes me realise how lucky I am regarding milk deliveries. I live in England and have always had a doorstep delivery. At present I have a litre of organic skimmed milk delivered 3 days a week. It comes in glass bottles which are recycled. The dairy offers a wide choice of milk and does offer other products. I have a box of organic fruit and vegetables once a week from another supplier. Growing up in Waynesboro, most everyone had a milk box on their porch, and the milkman would visit a couple of times a week- special orders put out the night before. Our milkman was also my little league coach, and he would sometimes pass by when I was cutting the grass- he would honk and then throw a pint of chocolate milk out in the lawn for me. Cool, Dad. Anyone deliver in Richmond now? Didn’t Mom also get it delivered in Newington. This was the milkman who was also a tad racist, right?